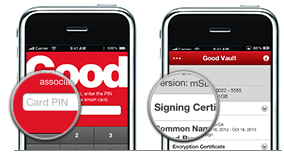 Good Technology has released Good Vault, a two-factor authentication product for the iPhone 4 and 4S to access Good for Enterprise email, reports Network World. The Good Vault system uses a sleeve that attaches to the iPhone. Users can choose a sleeve that reads smart cards or one that will read a microSD card. To access Good for Enterprise e-mail, the user inserts the proper card into the sleeve, and it becomes an authenticator. The user must also insert a PIN as the other form of authentication. Good plans to develop Vault products for iPads and Android devices and include other applications besides e-mail. This application will be available for download in the Apple App Store to those users who are licensed for Good for Enterprise and Good Vault.